(VIDEO) TIHs Crown Prince Naruhito and Crown Princess Masako of Japan Visit an Aquarium. On Friday, October 30, 2015, Their Imperial Highnesses Crown Prince Naruhito and Crown Princess Masako of Japan visited the Kagoshima Aquarium in Kagoshima, Japan. Tomorrow, the imperial couple will attend the 30th Annual National Cultural Festival (NCF) opening ceremony. Held under the theme, Riding the Kuroshio Wave of Cultural Restoration, the NCF is the “…largest cultural event in Japan, where arts and culture organizations and enthusiasts from around the country gather to engage in cultural activities, performances, and interaction with one another…” according to the official website for the National Cultural Festival. (VIDEO) News Regarding Her Majesty Queen Letizia of Spain. On the morning of Friday, October 30, 2015, Her Majesty Queen Letizia of Spain held an audience with organizers of the X Edición de los Premios Internacionales Yo Dona at Palacio de La Zarzuela in Madrid. Her Majesty also met with representatives from the Federación Española de Industrias de la Alimentación y Bebidas. HSH Prince Albert II of Monaco Attends a Gala Dinner in London. 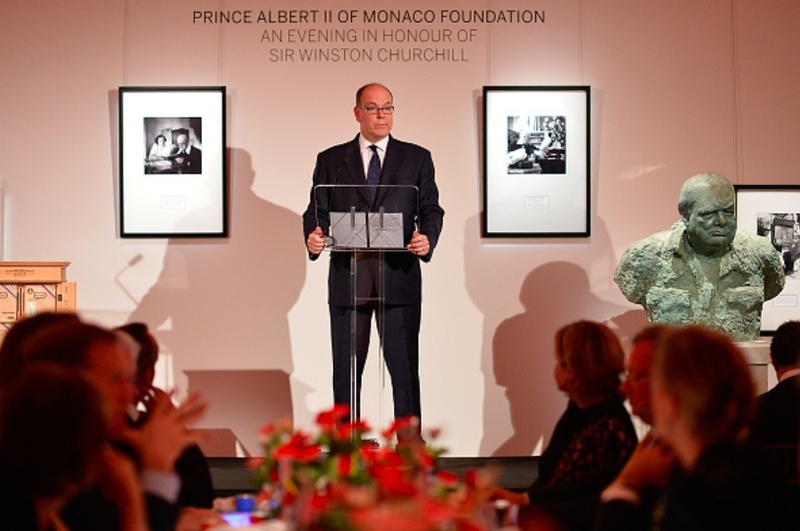 On the evening of October 29, 2015, His Serene Highness Prince Albert II of Monaco arrived at Sotheby’s in London, England, to attend a gala dinner, organized by the Fondation Prince Albert II de Monaco, in honor of the late Sir Winston Churchill. Royal guests in attendance included HRH The Countess of Wessex, HH Prince Alwaleed bin Talal Al Saud, and HH Princess Corinna Sayn-Wittgenstein to name a few.